Desktop Video Course (DVC) offers students the opportunity to complete the work for a particular course in a face-to-face environment over the internet. Desktop Video courses are a good choice for students who need to take classes at home or want to take classes off campus but need the structure of a classroom. 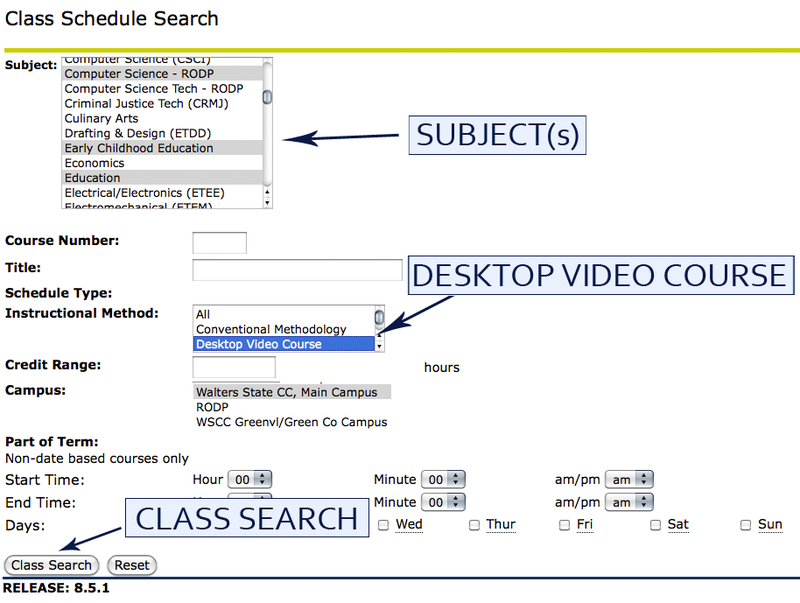 Most Desktop Video classes do not require any on-ground visits to any campus. Coursework is completed through desktop webinars and eLEARN. Library services, tutoring services, and all other student support services are obtainable through eLEARN or other electronic means. Students should check the "WSCC Links" at the home page of eLEARN for many services and online assistance. If you have difficulty with eLEARN, help is provided to students through either the WSCC HelpDesk (423.318.2742) or Instructional Design in the Division of Distance Education. To complete all requirements for these courses students must be able to access the Internet via a DSL or higher broadband connection from home or another location. At a minimum to participate with the instructor and other class members, students will also need a computer with a webcam, a speaker, and a microphone; or, students will need a tablet device. A USB headset with microphone is recommended for use with the computer, and ear buds are recommended for use with mobile devices. Students may access the Internet through computer facilities at the college's library on the main campus in Morristown or at the campuses in Greeneville, Sevierville, and Claiborne, or anywhere else they have access to the Internet. Students who are using their laptops at Walters State to attend the course are encouraged to use a USB headset in consideration of others within listening distance. If students are using a Walters State owned computer to attend the Desktop Video course, they are responsible for providing a USB headset and portable webcam to connect to the computer. The College is not responsible for obtaining or maintaining students' individual equipment or software for accessing the Internet.